Tottenham have signed Wigan full-back Pascal Chimbonda. The 27-year-old had been expected to leave the JJB Stadium ever since handing in a transfer request on the final day of the 2005-06 season. 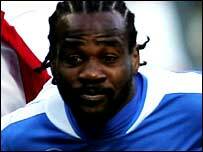 Tottenham had two bids for Chimbonda rejected in the summer, but finally agreed a fee with Wigan on Thursday. Chimbonda said: "I always wanted to be here. It is a footballing decision. Tottenham is a great club where I hope I can play my best football." Spurs sporting director Damien Comolli said: "I'm delighted Pascal has joined us, he is a player who really wants to be at this club and do well for us." He added: "He is a terrific right-back, solid defensively and good in the air. He is a complete player who can create chances offensively as well." Having joined Wigan from Bastia last season, Chimbonda's form in his first season in the Premiership earned him an international call-up from France. Tottenham had switched their attentions elsewhere after Wigan insisted they would not budge from their £6m valuation of the full-back. But the Lancashire side accepted an improved offer from Tottenham and Chimbonda travelled to London to complete the formalities. Wigan manager Paul Jewell said: "I think we have been strong enough to hold out for what we think Pascal is worth. "I had a price in mind all along and was never prepared to accept anything less than that. I feel we have achieved that goal."